On September 1, Cheryl and I attended worship at Rochester Church of Christ. Thus began a three month sabbatical journey that I have entitled “Reclaiming a Founding Vision.” Tomorrow morning I’ll be “back to work” at Central Woodward Christian Church. 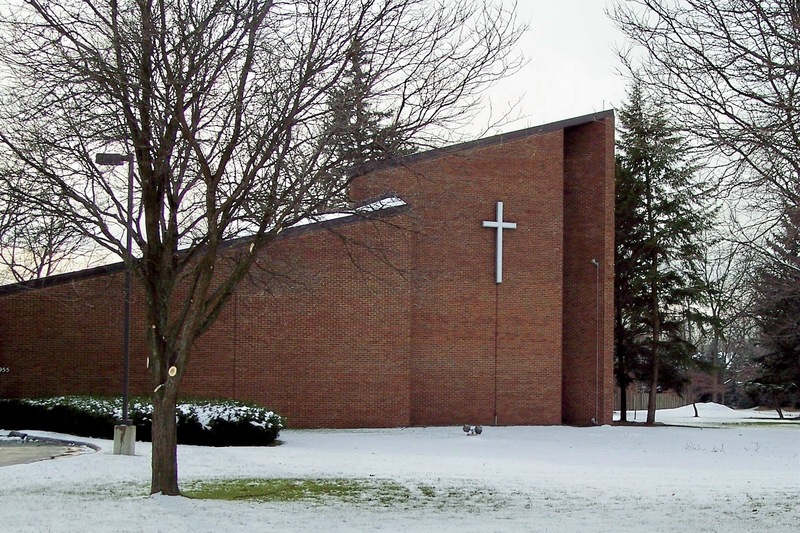 I return rested and ready to take up the calling of serving as pastor of Central Woodward, along with my other responsibilities in the church and community. I’ve been fortunate to have this opportunity, provided by the church, an opportunity that I encourage colleagues to take up themselves. I return on the First Sunday of Advent, and while we’ll be sharing in a service of Hanging of the Greens tomorrow so that I don’t have major responsibilities, it is fitting that I return on the morn when the church starts a new liturgical year. We begin with a sense of expectation that God is with us as we move into the future. During this journey I have been pondering not only the future or the present, but the past as well. I started out with the premise that the way forward requires a connection to the past. So, I journeyed to England and spent time at the Bodleian Library, Oxford, exploring the letters and papers of an obscure English priest who ventured out of the Established Church and into the wilderness of the Nonjuring Church. While in England I stepped back in time, visiting Stonehenge and the Roman Baths (at Bath). I worshiped at Christ Church Cathedral, Oxford and St. Paul’s London. Touching base with my own Episcopal spiritual heritage while in England, I discovered that this Anglican part of me runs rather deep. through the letters and papers of Edgar DeWitt Jones, founding pastor of the congregation I now serve. As with the England trip this was extremely enlightening. 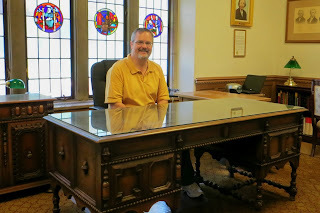 I even sat behind the Jones desk at the Disciples of Christ Historical Society. There is much to share about this experience and I shall do so in due time. When Cheryl and I traveled to Southern California in late October, I spent more time relaxing than researching. I thought I might do some research, but really didn’t get around to it. Instead, we saw friends and enjoyed being “back home” – both in Pasadena and in Santa Barbara. While in Southern California, I did reconnect with two pieces of my personal journey. First, on the day we landed, before we checked in at Fuller Theological Seminary, we stopped in at Angeles Temple, the mother church of the International Church of the Foursquare Gospel. We spent several hours touring the church and the Heritage Center (formerly the parsonage). This allowed me the opportunity to touch base with the Pentecostal portion of my journey. For those who don’t know Aimee’s story, it is a rather intriguing one. In a day when even liberal Protestants were looking for “manly men” (see the quote from Edward Scribner Ames on the mantle of the Disciples Divinity House, University of Chicago), Aimee was forging new paths for women in the church – as a preacher, church planter, evangelist, and religious broadcaster. The next morning I took a short trip to St. Luke’s of the Mountain’s Episcopal Church in LaCrescenta. Although I have no memory of this place, it was the place where I was baptized. I had the opportunity to sit and contemplate the course of my spiritual journey, one that really started in this place. The baptismal font from that era is no longer present, but in my imagination, I could reconnect with that moment in my life when my parents committed me to the life of the church. November was largely spent close to home – with my recent sojourn to the AAR-SBL Meeting in Baltimore being the sole excursion. But even at home I was able to continue the journey through my reading and writing (I finished two articles for publication). On most Sundays, I was in church somewhere. Two Sundays were spent in English Cathedrals. 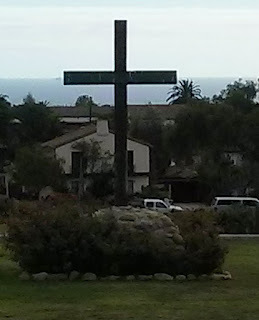 Besides these two Sundays, and the first week with my Church of Christ friends, I shared in worship at two Episcopal Churches, along with Disciples (Lompoc), Lutheran, Presbyterian, Methodist, and Roman Catholic congregations (for some reason I’m missing a week!). I didn’t get everywhere I’d hoped (I was hoping to get down to Little Rock Baptist Church, which resides in the former Central Woodward location in Detroit. I did a lot of reading. I attended a couple of clergy education events – one at Central Woodward with Scott Seay of Christian Theological Seminary and a Region-wide Anti-Racism training event. Besides that I attended several sessions of Brett’s Muslim-Christian Interaction class at Rochester College. Besides that I took walks, did some yard work, tried to fix a leak in the skylight over Cheryl’s shower – not completely successful -- and just enjoyed not going to meetings for three months! I had hoped to lose some weight along the way, but alas that didn’t happen! Year after year, as new members join a church and children come of age in the Sunday school, they accept a certain understanding of ‘who we are’ and ‘why we are together’. So much of this has to do with the circumstances of a church’s origins, often long buried but still real. It makes a difference if a congregation was born out of angry controversy and schism, or as the result of a miraculous outpouring of the Holy Spirit. (p. 112). The truth that is present in this book came to the fore during a session of the American Academy of Religion. The topic was the “emergent church.” Some of the conversation centered on the idea that the future of the church would be found in freedom from the constraints of tradition and institution. While I believe that the church continually is emerging in new contexts, it doesn’t emerge ex nihilo. It emerges from somewhere. It might be a reaction or a natural trajectory, but there is a connection to that which came before it. more convinced than ever that our future has connections with our past – and not just the past of Central Woodward, but the entire story of the Christian faith – the “communion of the saints” that bears witness to God’s realm.